As tedious as data entry services are, they are an indispensable process to businesses worldwide, no matter the industry. Why is it so? Well, the answer lies in its methodical operation. Since it is imperative that businesses keep track of their data, it requires experts in the field to enter them onto a computer (or any other electronic device that does the same). It also demands the need and expertise of such professionals since they have first-hand experience in working with complex information and organize them with great precision and tact. Albeit this is the case for bigger companies, few of the smaller ones find it hard to do it themselves or hire an in-house data entry specialist. This is where outsourcing steps in. Outsourcing data entry services is probably one of the most remunerative solutions available in the market. An endeavor such as this, can kill birds with one stone – First, it is considerably affordable, since firms will not have to incur additional costs in terms of office supplies, payroll etc. Second, they would gain ample time for their staff to work on other important tasks at hand. 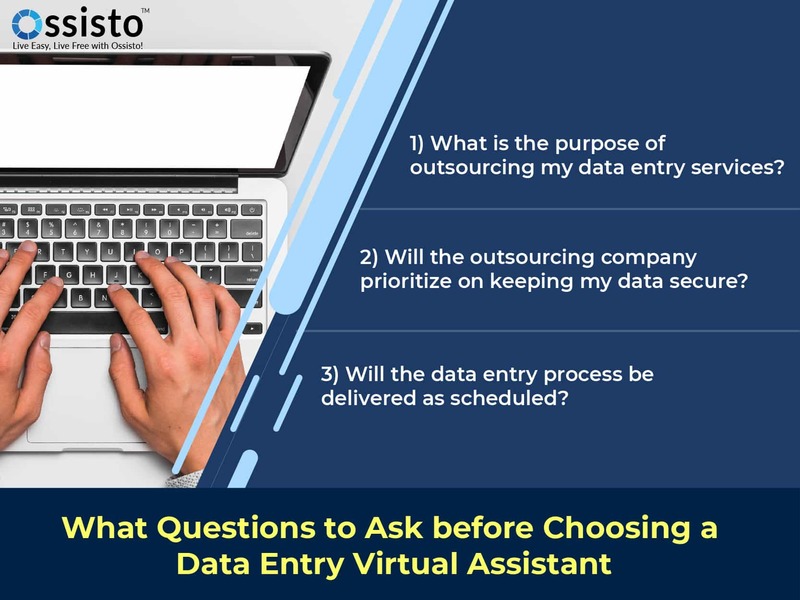 But, before you jump into thinking that outsourcing data entry is best suited for you, here are a few questions you will have to ask yourself. 1) What is the purpose of outsourcing my data entry services? The most important aspect of going about the outsourcing process is figuring out the objective of doing so. For this, one will have to assess the business’s needs and priorities. Then, determine if the work schedule allows for outsourcing to be fit into. 2) Will the outsourcing company prioritize on keeping my data secure? Fortunately, outsourcing companies today have access to the latest security storage technologies. Nevertheless, it is imperative on your part, as a business owner/manager, to inquire about if security measures have been taken. Without having done this not only will be placing your data in jeopardy, but will also be inviting malware into the system. 3) Will the data entry process be delivered as scheduled? Punctuality is one of the keys to success. There are companies out there that stall the process and there are those that don’t. It is up to your research capabilities to deduce which one of the innumerable outsourcing companies online, is better suited to your news. Now that we have covered the aforementioned section, below is a brief list of benefits that you could gain upon doing the former. ●Undivided Attention to Core Competencies: Not only does outsourcing data entry processes relieve the schedule off of unwanted roles but it also helps in aiding the personnel to focus on core competencies. This encourages better business partnerships, decisions and streamlined processes. ●Access to the latest data entry technologies: Outsourcing companies often keep themselves relevant by keeping themselves up-to-date with the latest technology that the market has to offer. This can be a boon compared to in-house data entry experts who would be lagging behind in this matter. ●Talent Acquisition: An outsourcing company will also have experts in the respective field who would have had years of experience and undergone rigorous training. Hence, it is suffice to say that you will have access to the best data entry pundits that will greatly benefit your business. ●Economical Costs: One of the most note-worthy benefits of outsourcing is that your operational costs would have significantly reduced upon doing so. It will save you plenty since you don’t have to spend on infrastructure, labor, taxes and so on, etc. for the virtual assistants to aid you better. ●Augmented Productivity: As the pressure and time on non-core operations get reduced, your business will inadvertently boost its productivity since the processes would have been comparatively streamlined now. You would have grasped the seriousness of taking in certain measures prior to outsourcing data entry services, by now. Hence it is advised that you make good use of them to ensure that your organizational foundations don’t succumb to structural in competencies.